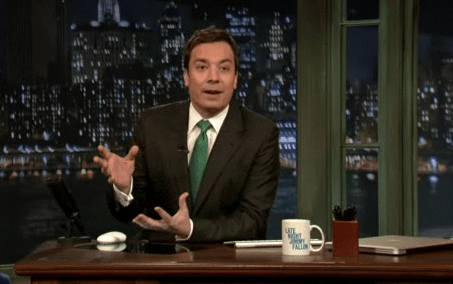 Why does Jimmy Fallon sit behind a desk? Do we really believe that is his office and all these people are coming to see him? Why does he have that coffee cup and pens on the desk? Is he really drinking coffee and writing memos to his staff? For that matter … Why does every late night show follows a similar format? … opening monologue, guests sitting on couches beside desks, skylines as backgrounds, a goofy companion off camera, a live band, suits and ties. Jimmy Fallon is working to break new ground in the Late Night show world with content made for the YouTube generation but he still locked into the same format was set by Johnny Carson over 50 years ago. Expectations. Our culture has expectations for what “late night television” is. Even innovators need to start where our cultures expectations are and build bridges from there to where they want to take us. Removing the desk and the other elements from the format of late night television would make it harder for the public to understand what it is. What are the assumed cultural expectations of “church services” that we’re foolish to remove from our services? … even if they are dated and old? What do we need to include in our services to make it easier for our community to connect with Jesus? We don’t do our services so we can impress other Church Leaders with how creative can be but we do it to serve our community. What do we need to include to help our audience? Come on Chris! I’d love to hear from you … what is the “desk” of worship stuff? I sometimes I wish that our church halls/ theaters/ sanctuaries didn’t have to put preachers, worship leaders etc up on stages. I know it has to do to sight lines and room design, acoustics for worship teams etc., but it can also suggest “performance”. When I speak anywhere, I often ask if it is possible to come down to the level of the people and share “amongst” them instead of “above them. The culture expects church to be people sitting in rows looking at the back of other peoples’ heads instead of being able to see each others’ faces. Great for anonymity, but not great for teaching that church IS the people. I don’t like that the focus of our worship space set ups are focussing on the people at the “front”. But maybe this is one of these “assumed cultural expectations”??? Saw one church where the “platform” was in the middle surrounded by chairs. Some folks have used the “theater in the round” for church … I does draw people in! Thanks for sharing Nancy Jane! I was listening to a podcast with a Jimmy Kimmel interview (http://www.npr.org/templates/rundowns/rundown.php?prgId=13&prgDate=1-23-2013) and he was saying the same thing, to succeed on a late night talk show he had to have a desk… there are so many talk shows, and isn’t it sort of amazing that this format works so well for so many… is it a gender thing that women talk show hosts like Oprah and Ellen don’t have a desk? Or is it a day-time thing? DJ! Thanks for dropping by to comment.